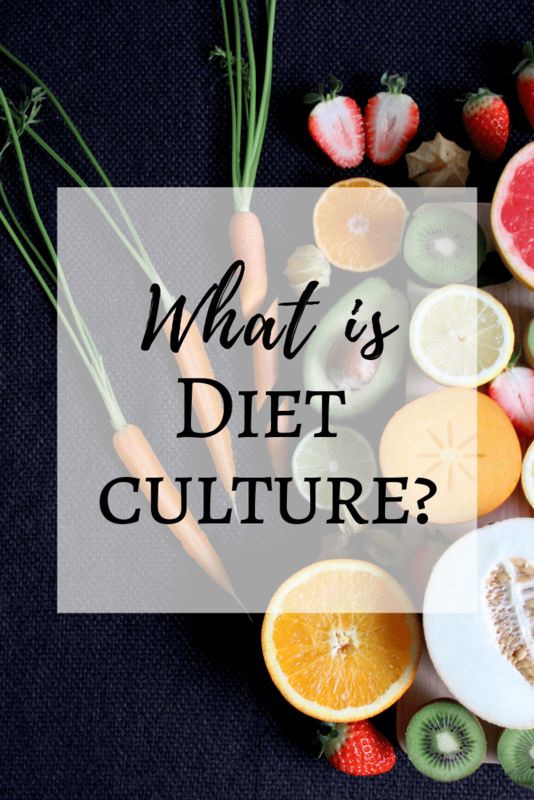 If you’ve been around here a while you’ve probably seen the term ‘diet culture’ thrown around, but it’s not always explained in detail. 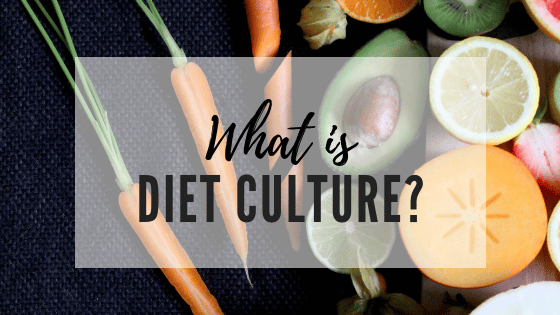 So, today I wanted to clear up any confusion and fill in the blanks by talking about what ‘diet culture’ actually is and what it means for you and the intuitive eating, non-diet movement. For many of us – even most of us – dieting, the goal of losing a few pounds or attaining ‘body goals’ has been a regular part of life. Maybe there are times when it’s more frequent – like as we approach summer, or around the holidays and big life celebrations – but it’s something that most of us can all relate to or have been involved in. It’s also something that’s totally accepted as normal because we live in a dieting culture. Something that’s interesting about the culture we have around dieting, is the acceptance that it’s never something we cross off our list – somehow there’s always more to do. As soon as you start one diet, you’ll hear about a new and improved version for you to try next, another program to enroll in or membership to join. Each diet or ‘lifestyle’ promises extreme, flashy and headline-worthy results if you can adopt behaviors that are just as extreme, flashy and headline-worthy. This is how so many get stuck in the dieting cycle and develop disordered relationships with food. We’re taught how to diet, but not often taught how to eat for enjoyment, satisfaction and nourishment. If diet culture was an animal, it would be a unicorn telling every single one of us that if we *just* bought enough skincare products, ate the right foods and exercised for a precise amount of time wearing the correct outfit – we could all be unicorns too. These statements may not seem shocking, and that’s partly because we hear many of them every day, but they are all grounded in the idea that a smaller body is a healthier, more desirable, more deserving of being an active and happy body, than another. Diet culture is the reason that moving away from dieting and choosing to respect and work with your body – instead of constantly trying to change it – is so radical. We’ve all been subjected to diet culture messages and have been conditioned to believe that not only does thinness and dieting equate to health, but that the pursuit of health makes one person morally superior to another. Diet culture is also what keeps us on that dieting cycle by feeding us the narratives that you’re ‘just one more diet’ away from beauty, success, happiness, etc. It’s what convinces us to spend our time, money and energy chasing standards of health and beauty that are created by the dieting and beauty industries. Diet culture is what teaches us that our self-worth and abilities are tied to our physical appearance and what positions ‘diets’ as the answer to all our insecurities, struggles and problems. But if you look at your past experience with dieting, you can likely see that’s not true. Diet culture consistently over-promises and under-delivers. A gym program that sells you a certain look or weight after 8 weeks of their classes. Why? One of my favorite quotes by Beth Pilcher, LMSW sums it up perfectly, “Even if we all ate and exercised exactly the same, our bodies would still look different”. Which is why we cannot guarantee any specific results like a change in X lbs or inches. If the program promotes fun, engaging and challenging movements – that’s something that is more inclusive, realistic and health-promoting for everyone. Spa treatments that claim to shrink your body. Why? Diet culture is not only about food, the beauty industry is also on board with treatments and products that promise to transform us in just “30 minutes or less.” These treatments are often expensive, inaccessible to most of the population and promote an aesthetic or look, instead of any actual marker of health. Why? These labels assign a moral value to foods and create doubt about foods that don’t have these labels, leading to more stress and confusion around food choices in general. Guilt is never an ingredient so all foods are ‘guilt-free’ and the term ‘clean’ doesn’t mean anything either. As long as you’re washing your hands and your produce, it’s clean! In tag-lines that imply your weight = your worth or happiness. Why? Just because someone is healthy doesn’t mean they’re happy, and just because someone is happy doesn’t mean they’re healthy. And neither of those things are dependent on your weight! Assigning a weight requirement to health and happiness perpetuates the idea that there is a certain look to health, there isn’t. In products or supplements that imply health requires exorbitant cost, time, energy and privilege. Why? This is an example of health-ism, the idea that your worth as a person is determined by your health and your pursuit of health. “Health-ism is a belief system that sees health as the property and responsibility of an individual and ranks the personal pursuit of health above everything else, like world peace or being kind. It ignores the impact of poverty, oppression, war, violence, luck, historical atrocities, abuse and the environment from traffic, pollution to clean water and nuclear contamination and so on. It protects the status quo, leads to victim blaming and privilege, increases health inequities and fosters internalized oppression. Clean up your social media feeds. Unfollow anyone who makes you feel like you’re not doing enough or who shares diet culture messages. Then follow more non-diet, body positive accounts including accounts that showcase a diverse range of colors, sizes, genders and abilities. Here are some of my favorite accounts to follow. Reject diet culture – change the language you use around food, bodies and health. Use the check-in “Would I say this to a friend?” before you say or think something to yourself. The voice we hear the most is our own, so we want to speak kindly. Find a community and support system. Unlearning diet culture and relearning how to nourish and treat your body from a place of respect is hard work! Luckily, you don’t have to do it alone. After you’ve cleaned up your social media feeds and are starting to recognize diet culture in everyday life, you’ll want to build up a community that can support you along the way. The Ditch the Diet – Intuitive Eating and Body Image Support Group is a great place to learn, connect and stay inspired with hundreds of other supportive members. The reason Alissa and I, as well as so many other registered dietitians and providers, call ourselves ‘non-diet’ dietitians is because there is an assumption that dietitians put you on a diet. It is in the name, after all. The label of a ‘non-diet’ helps clients and the public easily identify that they can trust us, and our non-diet colleagues, to help them navigate the diet culture we live in while also providing patient-centered care, no diets necessary! Ready to take the next step in rejecting diet culture? Schedule a discovery call and learn more about our virtual nutrition coaching programs so you can find balance and develop healthy habits, that work for you and your lifestyle.